Easter Lily is a real live Easter Lily plant that walks and talks. She only comes alive at Easter time. Her goal is to talk to people who are sad and to give them hope that life will be better and that they can do anything they want if they put their minds to it. 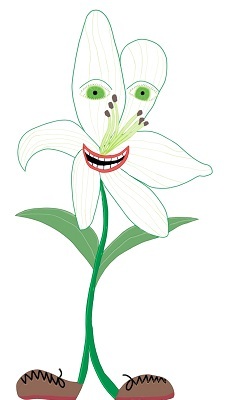 Easter Lily lives in a beautiful flower garden. The flower garden is very colourful. There are always lots of birds, butterflies and other small animals that hang around the garden as well. Easter Lily’s best friend is Renee, a sweet little chickadee. Renee talks about the other flowers, birds, butterflies and small animals. She lets Easter Lily know what the others are doing. You can read Easter Lily stories here. This entry was posted in Easter Lily Stories, Meet the Characters and tagged best, Easter, Easter Lily, flowers, friend, garden, lily, Meet Easter Lily. Bookmark the permalink.